Philippe asked me to post some great stuff I’ve been working on recently. So my name is Ethan Schroeder, and in case you are wondering, I’m one of the organizers of the Open Telephony Training Seminar coming up in a few weeks. Response Point "magic button." A voice recognition button for a PBX? It appeared that Microsoft really did something here. I wondered to myself if Asterisk could do it. A while back I utilized the LumenVox speech recognition software for Linux/Asterisk to build a speech enabled company directory for Asterisk. That was pretty cool, but a magic button would be a Killer App. for call control turned out to be a difficult task, but I managed to make it work. (Four-thousand-one/4-zero-zero-1/4’oo’1), or even speak the digits of a 7, 10, or 11 digit phone number. "Transfer to John Smith" – transfers a call to a name or extension. "Transfer to John Smith’s Voicemail" or "Transfer voicemail John Smith" – transfers the call directly into John Smith’s voicemail. "Park call" or "Park caller", parks the call and announces the parking slot. engine with their new "Asterisk Allison" voice). "Retrieve call [parking slot]"– Retrieves a specific parked call. Needless to say, that’s only the beginning! PBX market (it’s not as bad as you think). So if you haven’t already, take a peek at the training and see if you can attend. Get all the info on the traing site. As Philippe has already mentioned, we’re almost full and if you want to stay at the hotel where the event is at, you better be the next one or two registrations because as far as I recall, that’s about the number of rooms we have left before you’ll have to stay at a different hotel! I’m looking forward to seeing you and showing you this really cool speech technology! If you follow our blog then you know we are actively preparing for the Open Telephony Training Seminar next month and are also several weeks into the ongoing FreePBX 2.4 beta program. It is time to give you an update on how these two central activities are progressing and make sure you don’t miss out on some of the great discounts that are soon to come to an end. There have been some great discounts available but all good things must come to an end! Was procrastination on your New Years resolutions list (as in stopping)? If so it’s time to make good on your commitment if you plan on attending. The current $600 training discount will end on Friday, January 18TH so if you want to take advantage of this rate, register now! Also, our discounted rate with the hotel expires a few days after that. If you like to live on the edge with Asterisk, we’ve applied several patches in 2.4 to enable it to run on Asterisk 1.6, otherwise known as their SVN trunk. One of our developers, pnlarsson, has been busy on the bleeding edge (as he was with 1.4) proving Uncle Ward right in his Some Asterisk Resolutions for the New Years blog post about the constant changes they are making. And the really cool thing is 2.4 continues the legacy that 2.3 started – you can run Asterisk 1.2, 1.4 and now 1.6 on it – and all the compatibility magic is done for you! In order to help spice up some possible interest, we just checked in some additions that we’ve been toying with for some time. If you’ve ever played with DUNDi on a FreePBX based system then you know it can be done but requires more comfort and expertise then many of you may have to customize the dialplan. Well, we just added DUNDi to the outbound trunks which should take the barrier of entry down one notch. You must still setup dundi.conf based on the layout of your DUNDi cluster but once you’ve done that you should be able to do everything else in FreePBX! And the setup is easier then you might think! If you have been playing with 2.4 you may be familiar with the new extension registry that helps keep your system clean from duplicate numbering conflicts. If you haven’t seen this, just try creating a Ring Group with the same number as an Extension and see what happens. Now consider a branch office DUNDi cluster with this new mechanism, wouldn’t it be nice to see the same level of integrity applied across your branch office cluster? Come to the training and see how to take FreePBX to this next level, as just one example of the many advanced tools you will get in your “bag of tricks” with us! And that’s just a glimpse of what we will provide to enhance your existing knowledge or augment previous basic training you may have received. You won’t get this anywhere else! 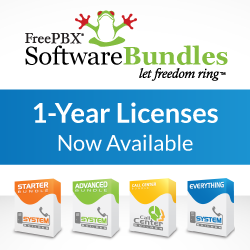 Now go out there and help us move towards a final release with all the great new stuff in FreePBX 2.4! And if you are thinking about the training seminar, don’t procrastinate and take advantage of the great savings going on right now.